The Griebel family were in-laws to my ancestors the Meng family. I don't know much about them so have tried to research them a bit on papers past and other websites. This is what I have so far. If there are mistakes or you have additions, then please let me know. Peter Griebel came to New Zealand on the ship Zealandia arriving 23 December 1870 with his sister Marie Griebel from the village of Kindenheim. Emilie Bratz arrived on the ship Friedeburg, 30 August 1872 as a single 18 year old general maid servant along with a lot of other Polish, Scandanavian and German immigrants. The ship sailed from Hamburg. Peter married Emilie Ernestine Bratz in 1873 in St Pauls Church, Flaxton, New Zealand. Biena Griebel married Robert Andrew Clarke in 1893 and had at least seven children. Rose Amelia June Griebel married Richard Brown in 1894. Adelina Christina Griebel died aged about 4 years in 1884, and is buried at Kaiapoi Public Cemetery (Plot 0290). John Frederick Griebel married Mary Henrietta Brown in 1893 after Grace's death. Mary Mabel Griebel had a daughter Henrietta Elsie Griebel in 1902, but no father is listed. She was married to Harry Kennett in 1907. Jacob Andreas Griebel married Nora Rubena Clarke in 1920. Peter Leopold Griebel died young in 1904. Ida Clara Margareta Griebel, there is no further information at this stage. Reuben Charles Griebel married Emily Smith in 1912. George Julius Griebel died in 1918 in WWI. "Mr Peter Griebel handed in a petition signed by Messrs George Brown and Michal Lynskey to clean out and deepen Greigg's road drain. Resolved—That the Surveyor be authorised to have the work done at the same price as tendered for last year, failing that we invite tenders for the work at next." This suggests that they lived in the Greigg's Road area at this time. On 5 February 1896 a "P. Gribel" was a witness to some pigs getting into six acres of peas and destroying them. He gave evidence in the case where the farmer was given 5 pounds compensation for loss of crop. Tragically, their son, Peter Griebel junior, aged 19 years, died on 5 September 1904 at Ohoka after a long illness. This article from the Press, 1 May 1906, suggests Peter Griebel senior was charged with not sending a child to school. There is no reason given for this. He may have had a very good reason, but we don't know. "This constitutes a record. At the Kaiapoi Magistrate's Court yesterday, Mr V. G. Day, S.M., presiding, P. Griebel, charged by Mr Blank, truant officer for the .Education Heard, with neglecting to send his child regularly to the Ohoka School, was convicted and discharged." 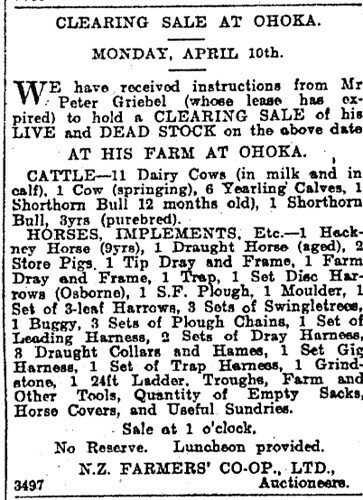 On 30 March 1909 the farm that Peter Griebel was leasing on Ohoka Road was being sold. It consisted of 13 acres 15 perches and a four bedroom house and outbuildings. Peter ended up moving farms. 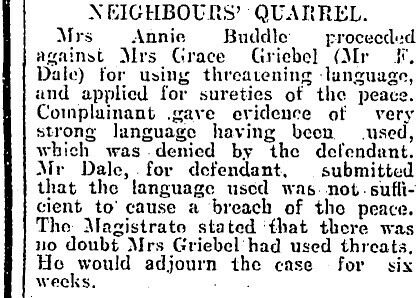 In the Press on 5 March 1912. "LOST, on the night of March 1st, from my place, fst, a Bay Draught GELDING, one white hind foot, white star on forehead, end Bhod all round. J. A. Griebel." 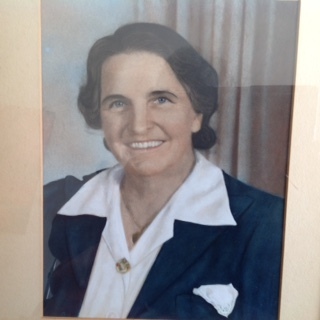 In 1913, John Griebel's daughter Florence Griebel, born in 1901, received a prize for Kaiapoi Primary School. On a list of land sales from 1 August 1915, P. Griebel sold 10 acres at Ohoka. In the Press on 9 Sept 1916, "Messrs Joynt and Andrews were instructed to go on with the business in connexion with the purchase of land from P. Greibel." And on 18 Jan 1917, Press, Mr F Griebel had a tender accepted for cleaning out Burgess's creek. From talking to a Griebel descendant the family lived at one stage in a cottage at the corner of Mill Road and Bradleys Road, Ohoka. This was across Mill Road from the Meng farm. And easy way to describe the location is the NW corner of Mill and Bradleys Road. The cottage is still there hidden behind trees and is now apparently painted red. That same year on 11 December 1916 Leslie Rolland Ward, son of Rachel Olga and Herbert Ward, died and was buried at St Bartholomew's Kaiapoi, aged only 9 years and 11 months. How very tragic for the parents. In the Press dated 22 August 1917, Mrs E Griebel thanks her friends and family for all the floral tributes, letters and telegrams and sympathies after a family bereavement. This was the death of her husband Peter. 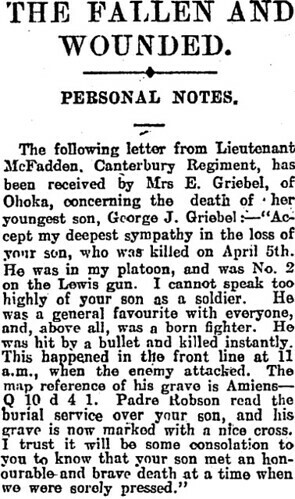 The next year, Emilie had tragedy again when Private G. G. Griebel of Ohoka died in action and this was published in the Ashburton Guardian on 19 April 1918. (also listed as G. J. Griebel of (E. P. Griebel, Ohoka). He had a medical examination for enlisting 11 May 1916 and passed. His name appears on the war memorial in front of Harewood Primary School, Harewood Road, Christchurch to this day. More information about George on another website. Click here. "Private George Griebel (killed) was the youngest son of Mrs Griebel and the late Peter Griebel, of Ohoka. He was 21 years of age, was born at Ohoka, and educated at the Ohoka School. At the time he enlisted he was working on the farm of his brother-in-law, Mr Clark at Russley. His brother, Jacob Griebel, who went with the Main Body, was on Gallipoli, and has been through most of the big fights with the New Zealanders in France. So far he has not been wounded." (Press, 24 April 1918) But Emilie had good news very soon after with the following: "Mr R. Griebel, has been advised that his brother Private J. A. Griebel, who left with the Main Body, is returning home. (Press, 16 Oct 1918). After all the tragedy in the family, Emilie, herself, kept on living and died in 1934, aged 89. If anyone has even one photo of the Griebel family I would love to see it, as our family has a large photo collection and I'm sure the Griebel family are in this collection more than once. I just don't know which photos as my ancestors decided not to label a single photo!! Very frustrating. Please email me or post a comment to get in contact. The following photo definitely has some Griebel's in it. Marie Ellenberger nee Griebel is there with her husband. It would be great if her brother Peter Griebel is there too. This is possible since the wedding was in the local area. It is the marriage of Marie Christina Ellenberger (niece of Peter Griebel) to Robert William Fisher 11 December 1902. Please help me in my desperate attempt to name some of the people in this photo! 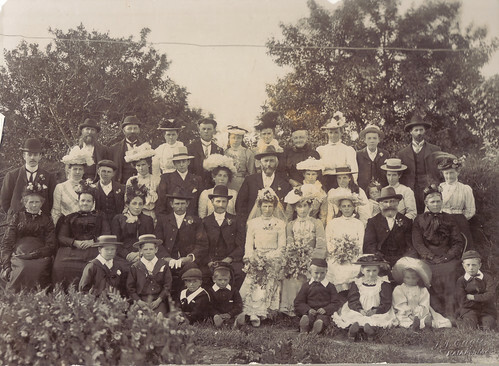 Front Row: ?, Sarah Winfield Meng (formerly Potts, nee Brown), ?, Ellenberger, Robert William Fisher, Marie Ellenberger, ?, Emma Elise Ellenberger, Jacob Nathanael Ellenberger and wife Marie Ellenberger (nee Griebel). A question for you. Jacob Andreas (Andrew) Griebel married Nora Reubena (Robina) Clarke in 1920. Was she his niece, daughter of Biena and Andrew Clarke? Or are my wires totally crossed here/ I keep going round and round. Help. Wow, it looks like you are correct Kaylene! I never picked that one up! To be totally sure though you need to order the marriage printout from Births, Deaths and Marriages. The code you need is: 1920/9649 Nora Rubena Clarke Jacob Andrew Griebel It should have Nora's and Jacob's parents on the certificate and that would prove it once and for all. If not, I still think it is highly likely as Nora Rubena is not the most common name! I can only find one birth and it is to his sister!!! Here is the birth for her future husband, to her grandparents! So I think you can safely say he married his niece, although certificates would absolutely prove this! Stranger things have happened in family history than marrying your niece! 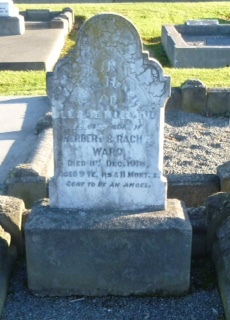 I've found the Waimairi Cemetery Records for Robert Andrew Clarke and Biena it reads: Robert Andrew died 6 June 1917 aged 49. His wife Biena died 27 April 1943 aged 68. I live around the corner from this cemetery. The age of Biena matches the birth of Birna (Biena) to Peter and Emily Griebel pretty closely. If you want more info or original documents sent to you, please email me on the address on the right side of this blog! What, no, let's try that again, I am having server problem. First the apology for not getting back to you for so long, no excuses I just plain forgot. Sorry. Thank you that info has been most helpful. I am about 27 mariages away from your family so have little to go on. And sorry no photos. That non labelling appears to be heritary in my branch as well. I came across Leslie Rolland (Holland on bdm lists) Ward's grave at St Bartholomew's, Kaiapoi, died 11-12-1916 died aged 9 years and 11 months. he seems to be the son of your Rachel Olga griebel who married Herbert Ward. (Herbert seems to be the brother of Grace Hannah Ward, Parents Hannah and John thomas, but you already know that). Juas an aside in case you haven't seen it Edwin Lord who married a Meng daughter is mentioned in Cyclopedia of NZ, in the Ohoka section, must be one of your's. I mean "Just" Not "juas", I really should proofread. Thanks Kaylene! Yes have seen Edwin in the Cyclopedia. In fact he bought one and it has been passed down our family. We are lucky to have such an old and beautiful book. Thanks for the info about Rachel Olga's son. I'll try and add it in to the blog. If you find anything else please let me know. I haven't done a lot recently with family research! A Shooting at Courtenay - Jabez Lord as witness!